With the top-rated free Kobo App, you can access Kobo’s 24/7 eBookstore with over 4 million titles and read them on your tablet, smartphone or desktop. Customize your reading experience with adjustable font types & sizes. Switch between devices and never lose your spot with synced bookmarks. Get personalized recommendations and read free previews. Search by author, title, topic or genre to discover your next great read. Share what you’re reading with friends on social media. 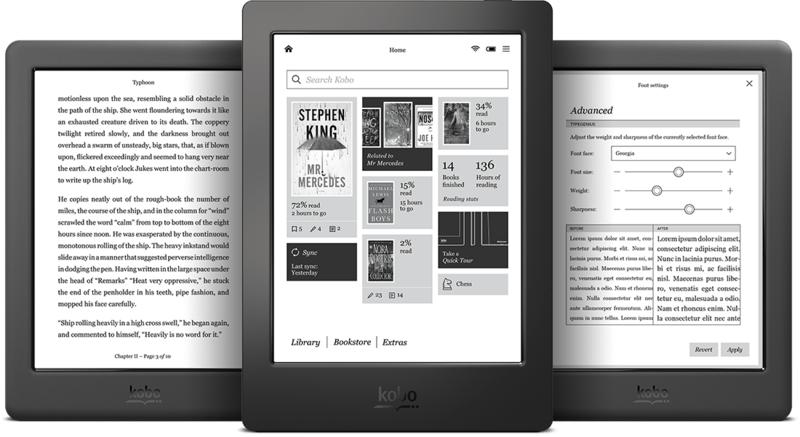 Kobo eReaders are easy to use and feature a book-like screen that reads like print on paper as well as a truly customizable reading experience. Store and carry thousands of eBooks everywhere you go and switch between eBooks quickly and easily. Read comfortably day or night with the built-in fully adjustable ComfortLight. Choose from dozens of font types & sizes. Read an entire eBook on a single charge with up to 2 months of battery life. Look up words in the built-in dictionary with the touch of a finger. Adjust margins, highlight passages and write notes.